Measured as snout to tip of the tail. Leopard shark: silvery gray to bronzy gray-brown; above, large, dark "saddles" interspaced with spots; underside, pale or tan. Both species have slender, flexible bodies. Body and wide fins allow them to make tight turns. Both species more active at night. Both species form mostly-female aggregations during summer. Leopards sharks may also form mixed species aggregations with other sharks and rays. How to cite: Leopard Shark (Triakis semifasciata) and Spotted Gully Shark (T. megalopterus) Fact Sheet. c2017. San Diego (CA): San Diego Zoo Global; [accessed YYYY Mmm dd]. http://ielc.libguides.com/sdzg/factsheets/ triakissharks. We wish to thank Dr. Andrew P. Nosal, PhD, for providing expert content review of this fact sheet. Dr. Nosal completed his PhD on leopard shark movement ecology at Scripps Institution of Oceanography in 2013. This research provided many insights into the behavior, habitat preferences, diet, physiology, and genetic relationships of leopard sharks near La Jolla, California. As of 2017, Dr. Nosal is Professor at University of San Diego and concurrently conducts research at Scripps Institution of Oceanography. This research focuses on the movement ecology of sharks and rays in southern California and Baja California. Dr. Nosal also holds interests in science communication and public attitudes towards sharks. He is a member of the IUCN Shark Specialist Group for the Northeast Pacific Region. Read more at andrewnosal.com. 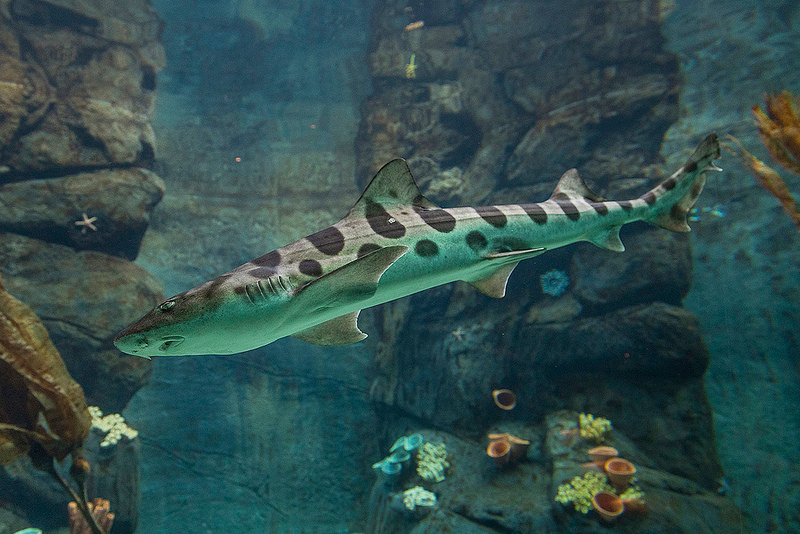 Thank you to Melissa Torres, who shared her knowledge of leopard shark husbandry for the Managed Care section of this fact sheet. Ms. Torres, Dive Program Coordinator and Aquarist at Birch Aquarium at Scripps, is the lead aquarist of ElasmoBeach, an exhibit that houses half of Birch Aquarium's leopard shark population. Ms. Torres leads animal care efforts for these leopard sharks, including health physicals and nutrition programs. She also coordinates and participates in diving activities to monitor the sharks’ behavior, health, and exhibit environment.